The importance of asking questions in selling is, well, unquestionable. Much (some may say too much) has been written about the what's, how's and why's of asking questions in sales. What has not received much attention, however, is the importance of assessing what level of information salespeople learn from the questions they ask. In my experience, there are three levels of information (or knowledge) that salespeople get from asking their questions. The deeper you get, the more valuable the knowledge and the greater your selling advantage. To make The Shift to selling results it is necessary that you get to Level 3. Level 1 - All about the transaction. You gain surface knowledge only. The questions are all aimed to assess the "need" for the "stuff" you sell. Level 2 - Moves below the transaction to the impact your product/service can have. This is a significant improvement from Level 1. The weakness here is that it's still all about the product/service and not about the customer/client. If you're involved in a simple sale and/or you are selling something that fits all of the buyers criteria (budget, specs, process, etc. 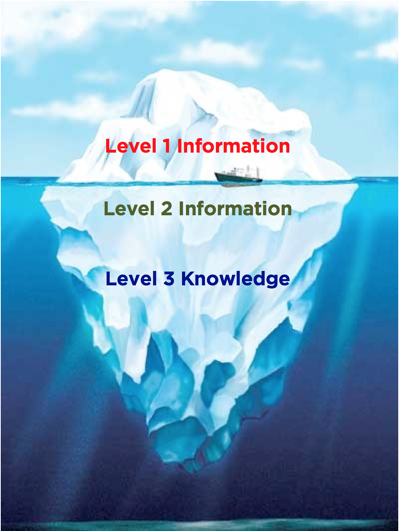 ), Level 2 information is often enough. However, if you're involved in a complex sale where multiple people play a role on the buyer side and their desires don't align, you customer is unclear about their needs or yours, and the buyers assessment don't immediately align (say, you'd like to earn a premium margin), then Level 2 information is not enough. Level 3 - Moves beyond the product or service your are selling and is all about the business results, and the barriers to those results, your customer/client is pursuing. Level 3 knowledge is critical if you want to radically differentiate your company and offerings or if you want to be in the "What's it Worth ?" conversation that allows you to enhance your margins while shortening the sales cycle. The salesperson needs to earn "a seat at the table." Customers are extraordinarily busy today and don't have the time to spend with most salespeople. The bigger and more common reason though is that in the vast majority of situations the customer isn't clear on the results they're pursuing or the barriers that are preventing those results. Far more often than not, the customer/client is treating a symptom and not the cause of the problem. If all you, as a salesperson, do is address the issues as your customer understands them, it is unlikely that a) you'll create any real value or b) gain any type of advantage in the sales process. So, next time you come back from a sales call debrief your notes and analyze what level your conversation is taking place at. If you're not spending half your time or more at Level 3, determine what changes you need to make to get there.